One of the pleasures and deep satisfactions of bookmaking, is delving into the visual, visceral, and tactile pleasures of materials, and how to employ and combine them. The following shares one step of my journey exploring and investigating the qualities inherent in materials. Though many artists do not make the kind of money that allows for indulgence in what might be termed, “material pleasures”, we may be seen as materialistic…for materials are the very warp and weft of our trade. We find our way to the ineffable through the use and exploitation of the materials we choose. 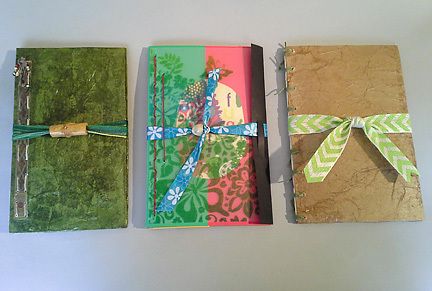 Single signature binding with wrapped covers, collage, patterned paper from scrapbook pads, drawing paper, recycled shirt-weight cardboard covers, binding sewn with hemp cord, ribbon. 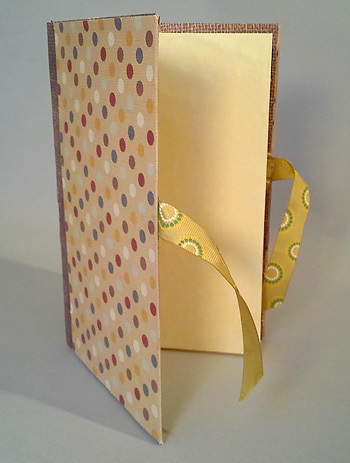 Ribbon inserted through book, between cover board and wrapping and over spine. 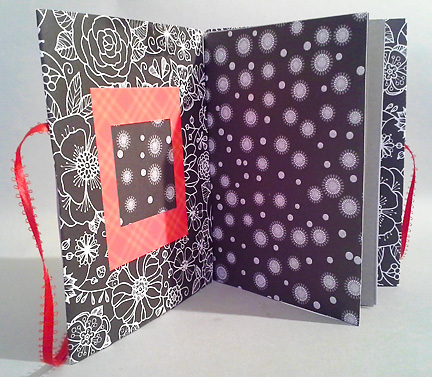 Artists Books, The Book Arts, Bookbinding, Bookmaking, The Making of Books, however you want to put it, is fertile ground for this exploration/exploitation. In this sense, we are turning even our language on its proverbial head. For what might be seen as negative, such as materialism (being “materialistic”) and exploitation (making use of and benefiting from resources) becomes an act of creativity, imagination and exploration through this transformative process. Which becomes ultimately, an act of expression. Three Books in Bows…all dressed up and ready to go. An exploration of textiles, papers, ribbons, beads, shells, repurposed materials, collage, hemp cord, jute, nylon and bindings. 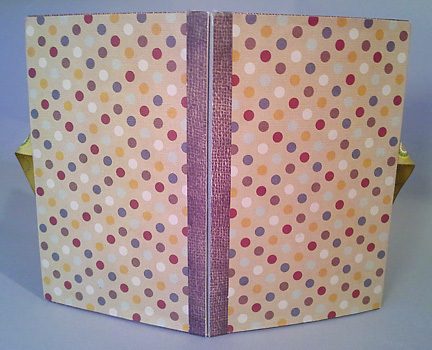 Textures created with tissue and brown wrapping paper and adhesive, layering of transparent material over collaged two-color cover, and stitching. 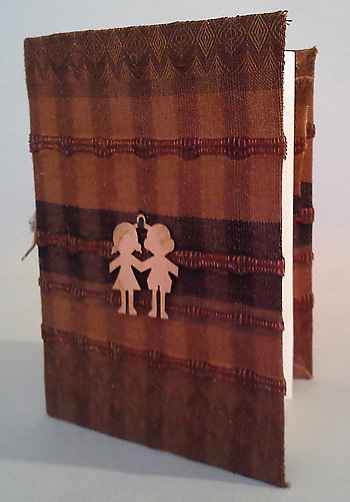 Detail added with recycled and found beads, a treasured shell, and gauzy, glittery, patterned and woven ribbon. Two Friends…My own version of an “art pauvre”, …a simple structure of humble, repurposed materials existing quietly in the world. 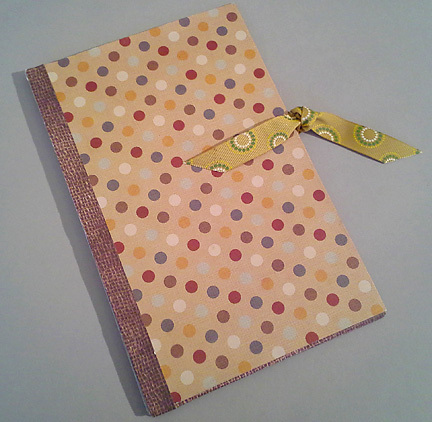 Single signature binding of recycled graph paper pages, using jute cord, covers and spine made of recycled cardboard, covered with scraps of recycled cloth. Repurposed ornament stitched to front cover with hemp cord. The pleasures and mysteries of the seemingly mundane and everyday. Unzipped…so named because there is a zipper stitched to the front cover…(to be depicted at a future time if a good picture can be made of it.) Another example of my expression of “art pauvre”. 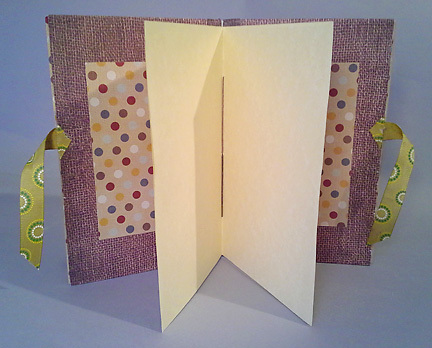 Single signature book with pages made from recycled paper, covers and spine made of recycled cardboard, covered with repurposed cloth. 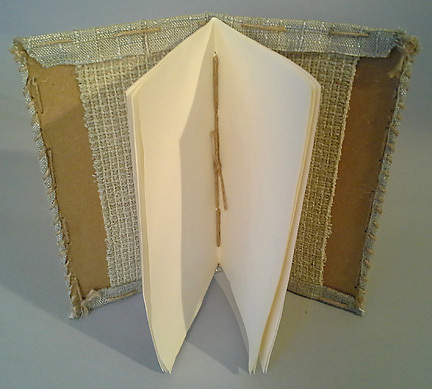 Jute cord used for binding, and to attach exterior cloth to covers. Interior cloth strips/insets glued on. 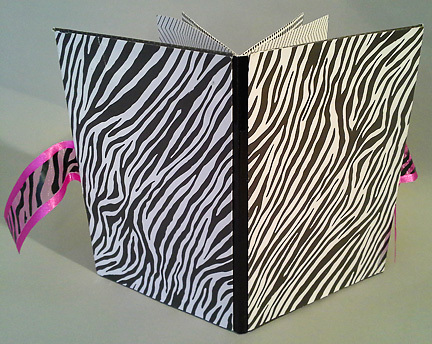 Zebra Book…Single signature binding with wrapped covers, patterned paper from scrapbook pads, recycled shirt-weigh cardboard covers, folded card stock weight spine, patterned gauze ribbon, embroidery thread used for sewing. 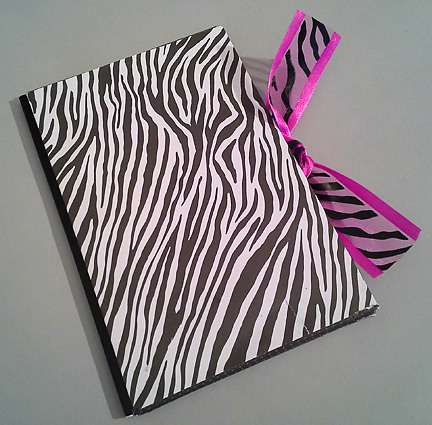 Ribbon inserted through book, between cover board and wrapping. 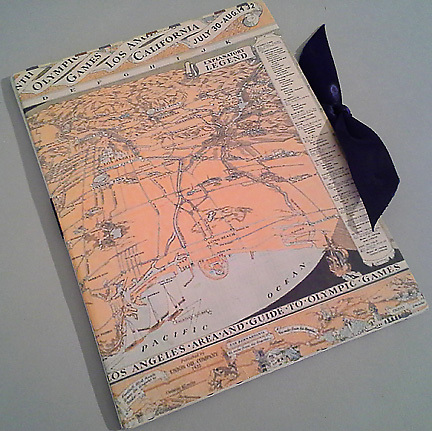 Lace 2… Single signature binding with wrapped covers, collage, patterned paper from scrapbook pads, drawing paper, recycled shirt-weight cardboard covers, binding sewn with hemp cord, ribbon. 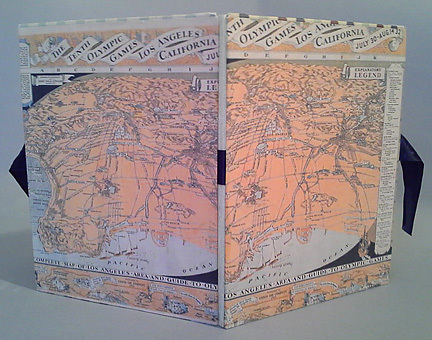 Ribbon inserted through book, between cover board and wrapping and over spine. 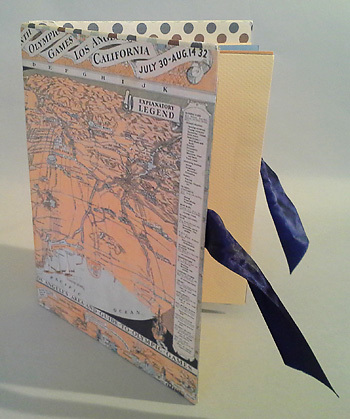 Los Angeles, California, Single signature binding with wrapped covers, collage, maps printed on multipurpose paper, patterned paper from scrapbook pads, drawing paper, recycled shirt-weight cardboard covers, binding sewn with hemp cord, ribbon. 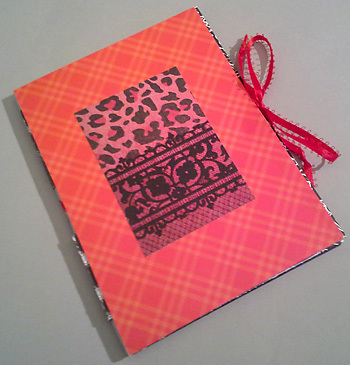 Ribbon inserted through book, between cover board and wrapping and over spine.